Come to Mexicali Mexican Grill on October 25th in Webster! 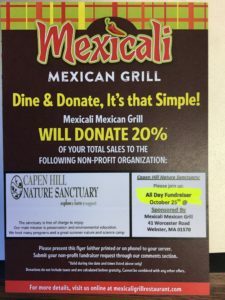 They will donate 20% of your total sales to Capen Hill Nature Sanctuary! Dine and Donate! You can either print this or show it on any digital device. They will do take outs as well. When calling your order in let them know it is for Capen Hill Fundraiser. Thanks and hope to see you there!